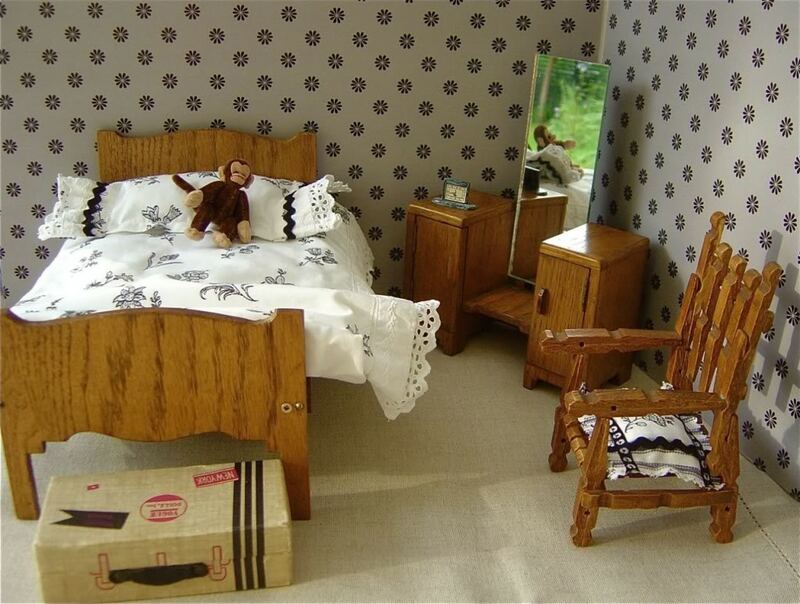 BED: Sturdily-made oak bed (with matching dressing table) from the 1920s or 1930s. The bed has a solid base and measures 9.5in/23.5cm long. The dressing table has had its mirror replaced with one with buffed edges. BEDCLOTHES: Handmade, black-and-white ticking mattress, vintage handkerchief sheet, soft blanket, and flower-printed bedspread with vintage lace trim. Pillowcase in same print, trimmed with black rick-rack edging. All bedclothes are hand-washable. 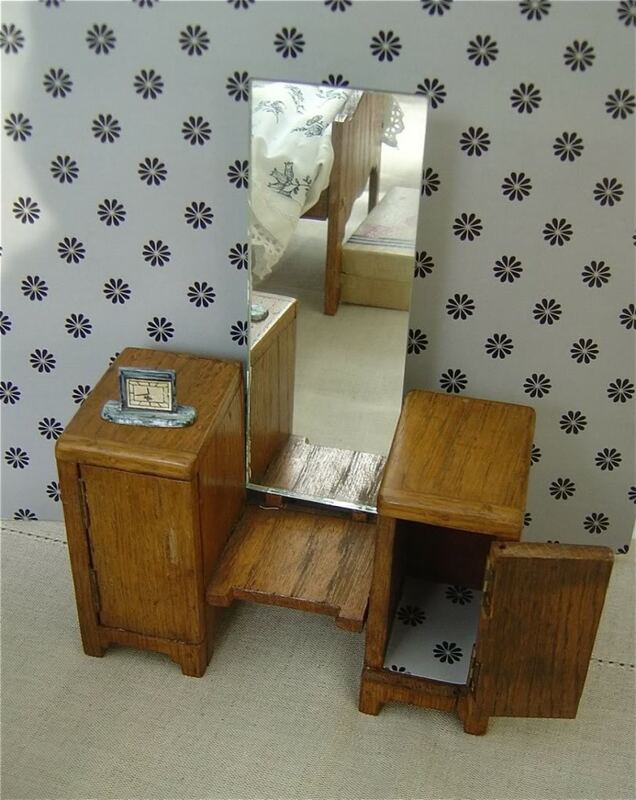 DRESSING TABLE: Has two little cupboards, with doors that open and close, although one oak pull is missing (left side). Comes with metal, Art Deco clock (non-working). Safety note: Please take care with the real glass mirror on this piece, even though all edges have been buffed, it is still breakable. CHAIR: Handmade from oak clothes pegs in the early 20th c., with new cushion. SUITCASE: A vintage Ginny doll cardboard suitcase to hold dolly's shoes or to take on her travels. Jointed monkey (new) travels well too. RUG: Hand fringed from a vintage fabric scrap. WALLS: Covered in modern wrapping paper, which has been mounted on two pieces of 5mm thick A3 foam board. Each piece of foam board measures 42x29.5cm or 11 5/8 x16 3/8in. DOLLS: Chosen from our selection of vintage dolls - please see the relevant section of our website for a greater choice. The ones shown here are a Lesney 'Ginny' doll, who is being tucked up by a 'Toni' doll. Note that there are lots of other clothes available for both dolls - please see the CLOTHES and MISCELLANEOUS sections of our website for a small sample of what is available.